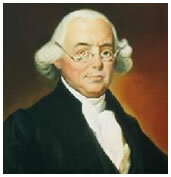 Founding Father, jurist and American statesman James Wilson, was among the first supporters of the American Revolution. Wilson was born on September 14, 1742 in Carskerdo, Scotland and emigrated in 1766 to British America. He first attended St. Andrew's University and, later on, Edinburgh and Glasgow Universities in Scotland. He never achieved a degree but through good connections evidenced in letters of introduction he brought with him to the America, he taught Latin and English at the former College of Philadelphia (which is now the University of Pennsylvania), where he was later on given the award of honorary Master of Arts degree. He obtained his law studies from John Dickinson's office and set up his practice in Reading. He married Rachel Bird, moved to Carlisle and continued his practice specializing in land law. He was one of America's first legal philosophers and was among the noted men who signed the United States Declaration of Independence and is often cited as among the most influential constitutional convention delegates, second only to James Madison. Wilson was a legal theoretician and elected twice to Continental Congress. He was one of six justices appointed by George Washington for the first Supreme Court of the United States. He was prominent as a leading proponent among the Framers of the United States Constitution in drafting the United States Constitution. In August 1774, he became notorious when he wrote and published the pamphlet, Considerations on the Nature and Extent of the Legislative Authority of the British Parliament, which refutes the Parliament's authority and constitutional power over the Colonies. This established him as a revolutionary in politics, a Whig leader and one of the most influential leaders. He became a colonel in the 4th Battalion of Associators, and later on, brigadier general of the State Militia. When he was elected to the provincial assembly and Continental Congress in May 1776, he advocated independence between the judicial, legislative and executive departments. He was among those who led the Native American policy formation. Together with Thomas Jefferson, Robert Livingston, John Rutledge and John Adams, he was part of the Committee on Spies in 1776. Wilson became France's Advocate General in America from 1779-1783, defending loyalists and sympathizers. Wilson served as a member of the Committee of Detail in 1787 where he a key role in the drafting of the Constitution of the United States. One of his proposals was the Three Fifths Compromise and a popularly elected president and senators. He was part of the redrafting and ratification of Pennsylvania State Constitution in 1776. He was appointed one of the directors of the Bank of North America in 1781 which was founded his associate and client, Robert Morris. He became the first law professor of the College of Philadelphia in 1789 and gave a law lecture series in 1790. He served as Supreme Court associate justice in 1791. The Law School of the University of Pennsylvania based its foundation on his lectures. He also started an official digest of Pennsylvania's laws. He died of a stroke in August 21, 1798. He was buried in the Johnston burial ground in Hayes Plantation near Edenton, in North Carolina and was later moved to the Christ Episcopal Churchyard in Philadelphia in 1906.